With my son approaching another birthday, I’ve started thinking more seriously about his schooling from elementary to college/university. My parents paid for a significant part of my education and I would like to do the same for my son. Given the rising cost of tertiary education, I figured the earlier I save the better. And thanks to the tax advantages, one of the best ways to save for a child’s college education is to put money regularly into a 529 plan. This plan is named after Section 529 of the federal tax code and also known as a Qualified Tuition Program or Plan (QTP). According to the College Board the average annual cost of tuition, room, board, and fees was around $38,000 at a private four-year college and $16,000 at a public four-year college. So early tax-advantaged saving coupled with the benefits of compounding make investing in a 529 plan a smart financial move. There are two main types of 529 plans, prepaid tuition plans and college savings plans, and each comes in many forms. A 529 prepaid tuition plan lets you buy tuition credits or units at today’s rate and use them later when your child attends a participating college or university. The value of your credits – often called “shares” – increases tax-free at the same rate as tuition, so a prepaid tuition plan lets you lock in at the current tuition rate. For example, if you buy shares worth a year’s tuition at a participating college, your shares will always be worth a year’s tuition, even years later when the tuition might cost much more. Most prepaid tuition plans are sponsored by the states, and each state sets its own rules for them. State prepaid tuition plans generally cover tuition only at public colleges and universities in that state, though some cover tuition at private universities in those states. Some states offer extra benefits to people who contribute to their 529 plan, such as matching grants or an option that lets you save for room and board in addition to tuition. There are also Independent 529 prepaid plans that cover tuition at more than 250 private colleges and universities throughout the country. However these plan have various restrictions and relatively limited investment options. 529 college savings plans on the other hand are much more unrestricted and let you make deposits in an account you can draw on later to pay for eligible college expenses. You can usually choose among several or more investment options for this type of plan, such as mutual funds or money market funds. And the value of your investment grows tax-free if used for eligible college expenses. If you withdraw money for other purposes, you will be liable for taxes and penalties. Think of a 529 college plan as a 401K plan for college expenses. Unlike prepaid tuition plans, college savings plans do not allow you to lock in at today’s tuition rate. Your investment grows at a market rate and may lose value in an economic downturn, although some plans guarantee a minimum annual return. But you can use the money in a 529 college savings plan at any college or university in the country and use it not just for tuition but for room, board, and any other eligible education related expenses. – Start by looking into your state’s prepaid tuition plan. All fifty states and the District of Columbia sponsor at least one type of 529 plan. The plan in your state may have unique advantages for residents, such as an exemption from state income taxes for qualified withdrawals. To learn more about 529 plans, visit the non-profit site for the College Savings Plans Network (www.collegesavings.org). Also check your local state’s 529 site for details on options, benefits and pricing (Google your state name and 529 plan). – Before you start a serious search make a list of your child/families college needs, desired colleges/states and the amount you could contribute on a monthly basis towards a 529 plan. There is no point over extending your finances and taking on more debt just to contribute to a 529 plan. – Consider a college savings plan or independent prepaid tuition plan if your child may need flexibility based on future moves across state lines or for special education needs. These plans may be good a option if you aren’t sure that the schools offered by state plans would suit your child. 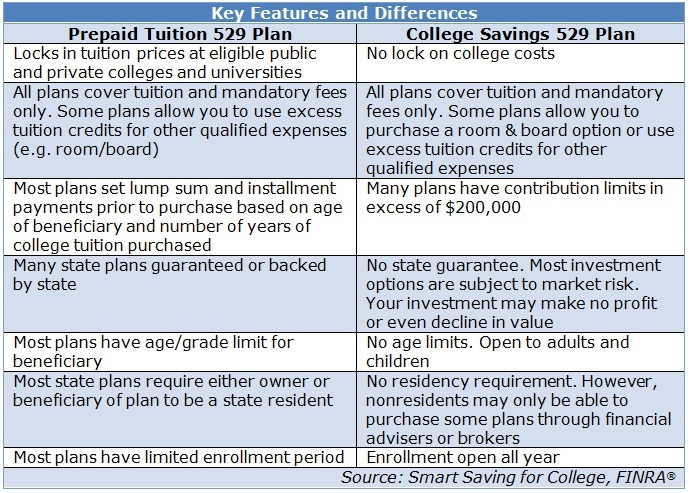 The Independent 529 Plan site (www.independent529plan.org) has more information about these plans, including a list of colleges that participate in them. – Make sure you understand the fees for college savings plans. Some college savings plans charge high fees, such as a “sales load” (a fee paid when you buy or sell shares) of as much as 6 percent and an annual administrative fee of 2 percent. If a fee is steep, you might be better off investing on your own or in another type of plan. – The Securities and Exchange Commission (SEC) offers a list of questions to ask at www.sec.gov/investor/pubs/intro529.htm) and includes a chart comparing prepaid tuition and college savings plans, facts about how a plan may affect your child’s eligibility for financial aid, and links to lots of additional information. If you look into a variety of plans, including some in your state, you’ll have the best sense of your options and how your child might benefit from them. The earlier you start the better and hopefully the above guidance can start you going in the right direction. Good tips, and very admirable planning ahead for your kid. I’m trying to make up my mind on how to start saving. I’ve also heard there is some benefit to saving the same amount of money you planned to put into a 529 into your retirement accounts but earmarking it for college (unofficially). The benefit being that you could qualify for more financial aid when the time comes.